Nakhimov Square may not have been packed out for the broadcast of Vladimir Putin’s speech but the numbers were decent and the mood good-humoured. Small children cut arcs in the air with the Russian tricolour as their parents’ faces creased into smiles in the sunshine. The striking thing was the relaxed mood. Security was minimal and nobody seemed bothered by the media presence now. Presumably supporters of union felt they had got their result and could breathe easy. Afterwards families headed down to the nearby quays to photograph each other against the picturesque backdrop of the bay, tricolours in hand. The waterfront, scene of many tragic chapters in this city of sieges, is a happy place this afternoon. Afterwards, Putin signed a treaty with the Crimean President Sergey Aksyonov and the mayor of Sevastopol Alexei Chaliy to make Crimea and Sevastopol part of Russia. Sevastopol has a special status, and is officially separate from the rest of Crimea. The general mood of the people around me has been jubilant, with lots of people telling me how happy they are that Crimea will now be part of Russia. There are a lot of smiles, and the mood seems to be much lighter than it was before the referendum. As I said yesterday, I don’t agree with the way this has happened, but I do think that the results are what the majority of people here truly want, even taking into account the number of people who abstained from the referendum. I don’t believe Crimea can ever truly be part of Ukraine again, no matter whether the international community recognises it as part of Russia or not. From now on, I will assume Crimea is Russian. Echoing many people here, Putin stated that “In the hearts and minds of people, Crimea has always been and remains an inseparable part of Russia.” (all quotes from the speech taken from here). He mentioned the courage, bearing and dignity of Crimeans, and I would extend this to the Ukranian soldiers and sailors who have faced a very difficult situation and remained calm. “He denied Russia was interested in annexing more territory.” I believe this is true. 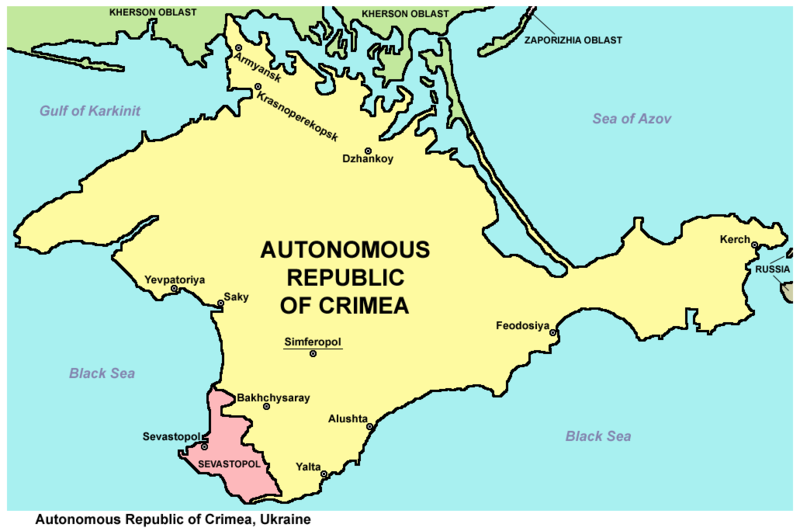 Crimea has a special status in history which means that it has always been much more Russian than other areas. It is a clear-cut area geographically, and relatively easy for Russia to take control of. Regardless of however much other areas might want to be part of Russia, it will be nowhere near as easy as it was to get Crimea. The words and actions of Ukraine have really not helped the situation. There were people here who would originally have voted for autonomy within Ukraine, but the perceived weakness of the Ukrainian government and the West, and the ‘strength’ of the Russian government, as embodied by Putin’s statement above, have swayed them towards Russia. The current government in Kiev has done very little to address the concerns of the pro-Russian factions. Max Seddon, BuzzFeed tweets to the BBC: The failure to reach out to Russian-speaking Ukraine has created a huge vacuum for Russian propaganda. It spreads like wildfire in Crimea. This is one attempt they made today, which I feel is too little, too late. On Tuesday, Mr Yatsenyuk said that “for the sake of preserving Ukraine’s unity and sovereignty”, Kiev was prepared to grant “the broadest range of powers” to Ukraine’s other mainly Russian-speaking regions in the south and east, which have seen pro-Moscow protests in recent weeks. In a pre-recorded address on Ukraine’s 5 Kanal TV – delivered in Russian – Mr Yatsenyuk said the reforms would give cities the right to run their own police forces and make decisions about education and culture. Throughout the process, the Ukrainian government has declared the referendum to be illegal and illegitimate, but they haven’t provided an acceptable alternative. I think this was a major stumbling block. If I were Crimean, I would want to be able to choose my destiny now rather than wait for some indeterminate future fate. I’ve heard people ask what Ukraine has done for Crimea, which I can’t comment on as I don’t know the history. People here talk about all the potential benefits of joining Russia, some of which I will try to discuss below, along with what I perceive to be the drawbacks or the obstacles which will have to be surmounted. The initial protests in Kiev were sparked after President Yanukovych refused to sign an agreement creating closer ties between the EU and Ukraine. It’s clear that Europe didn’t really think through how Russia would react to this agreement. As officials now admit, the drafting of the association agreement withUkraine – which was the trigger for the current crisis – was largely left to technocrats. He went on to bemoan that there was no big debate as to how Russia would react to all this. They could probably not have anticipated that this would open the door for Crimea to rejoin Russia. Now, along with the US and other parts of the international community, they are fighting a losing battle of putting sanctions in place to try and reverse a fait accompli. The individual sanctions put in place already don’t seem to have phased the Russians at all. Perhaps if the sanctions get worse, it may affect Crimea itself, particularly with regard to the economy. If Russia starts losing money, it will be less willing to invest in Crimea. The events in Crimea have caused other areas to request the right to become part of Russia, chief among them the Trans-Dniester region between Moldova and Ukraine. The citizens of Donetsk, a city in eastern Ukraine, have also requested a referendum, amid much violence by pro-Russian protestors. I don’t think it will be anywhere near as easy for either of these places to join Russia, since they are both geographically isolated from it (and yes, I know about the Kaliningrad Oblast). I also don’t think Russia will send troops into either of these areas. The only thing that might change that is if Ukraine cannot find a way to stop the violence in Donetsk and pacify the people there themselves. I think the situation there is much more volatile than it ever has been in Sevastopol. Of course, there is also the risk that all of this jubilation will be short-lived, and that Moscow will not follow through on its promises. The hopes of the people of Sevastopol and Crimea could be dashed, especially if the corruption those in Ukraine were hoping to escape by getting rid of Yanukovych remains endemic in the region. The New York Times has compared the situation here to what happened when South Assetia first became independent from Georgia. In my opinion, this is the area where joining Russia will have the biggest effect, and I think there will be many economic problems here caused by the change over. The Russian Federation will need to invest a lot of money in Crimea, and this may not sit well with other parts of the country. They also may not be able to put their money where their mouth is, and corruption is very much part of life both here and in Russia, so there is no guarantee money will actually get to where it needs to be. Within a couple of weeks, the Russian ruble will be the official currency of Crimea, with a transition period where the Ukrainian hryvnia will still be accepted. People are clearly unsure about money they have in Ukrainian banks. I saw long queues at a Privat Bank cash machine today, with about 25-30 people waiting to get their money out. Other Privat Bank cash machines weren’t working at all. This seems to be the main bank people are worried about. Some people believe that they will earn more as part of Russia than they can in Ukraine. This view seems particularly prevalent among pensioners, who state that the Russian pension will be higher than the Ukrainian one. Here’s one man in Yalta. I’ve read other mentions of this, but can’t find them now. One of the children I taught today was very happy that Crimea had ‘gone home’ to Russia. He said his mum was too, but his dad is not so sure because his business, selling technology like mobile phones, is mainly with Ukraine. It is the small- to medium-sized businesses like these which I think will suffer most from the transition. They do most of their trading with Ukraine and will now have to build up new reputations and new trading partners within Russia, as I think it’s unlikely their Ukrainian partners will want to continue working with them, given the current relations between the two countries. The Russian leader adds that most of the other groups are also oriented towards Russia. He mentions that Crimean Tatars were unjustly repressed in the past. He says measures should be taken to finish rehabilitation of the Tatars who returned to Crimea from internal exile. Fears of potential ethnic cleansing, at least from the official Russian side, seem to be unjustified, and in fact, Putin is stating that he wants to help the Tatars. 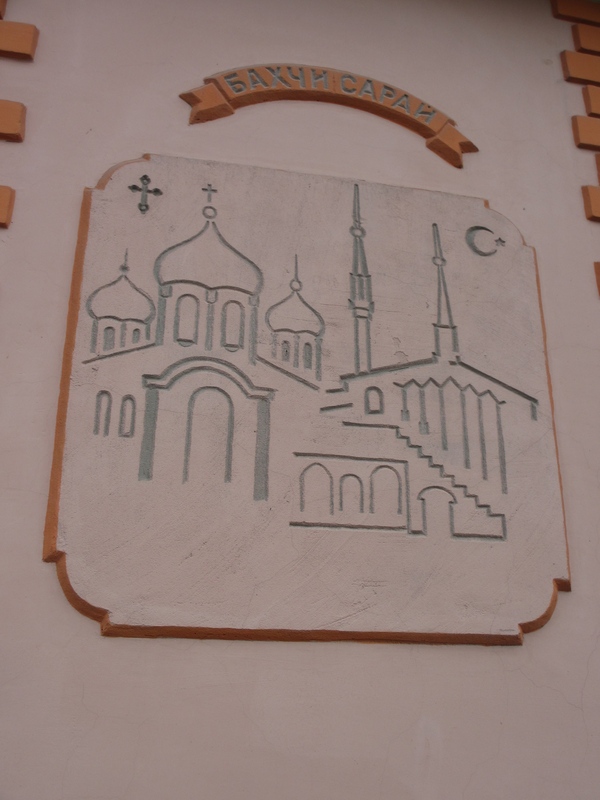 Bakhchiseray is one of the areas with a large Tatar population. Some Ukrainian soldiers have been given the option of joining the Russian army, or being allowed to uproot their lives and leave for Ukraine. I don’t know if Russia will make a deal for Ukraine to lease bases in Crimea, but I doubt either side would find it possible to reach an agreement on this, as Ukraine still considers Crimea to be theirs. I also doubt they could find the money to pay for such a lease. I don’t think it would be in Russia’s interests to persecute the Tatars or the pro-Ukrainians in any way. They already have enough to worry about on the international scene, and they and many of the citizens of Crimea have managed to get what they wanted without violence. It would be pointless to change that now. It is clear that the attack on the military base in this city was not directly carried out by Russian soldiers but by armed men sympathetic to Russia. The roadblocks set up by pro-Russian forces outside cities like Sevastopol, and on the border between Crimea and Ukraine, will have to disappear at some point. It is these people who worry me, far more than the soldiers. They have taken the law into their own hands, and it is not clear exactly who is running them, and where exactly they think their authority is from. Nobody seems to have any control over them, and a lot of them have guns. One of my colleagues was searched on his way back from Yalta. I have no idea what exactly they were expecting to find, or how their ‘protection’ helps the city in any way. This is one of the reasons why I have postponed my exploration of Crimea and stayed in Sevastopol, despite the beautiful weather of the last couple of weekends. Other claims of violence and disappearances also need to be verified, investigated, and if proved true, the perpetrators need to be punished. Another transition will be that from Ukrainian law to Russian law. Russia has said that those practising here will be allowed to continue without having to retrain, although there will obviously be a period while they learn how to operate within Russian law. Two of my students who are related to notaries said their relatives are worried about their jobs, as there is not as much notarising required under the Russian legal system as there is under the Ukrainian one. There is also, apparently, a quota of notaries in each area which is much lower than the current number of notaries in Sevastopol. Despite this, one of them still voted to join Russia. I’m not sure about the other one. My main concern here is what it means for my legal status in Crimea. I have a Ukrainian work visa and residency permit. I don’t know what I will have to do to make sure I am legally allowed to continue working here now, which is a particular concern since I’ll be going to the UK for a week at the start of April. I’ll be coming back in via Simferopol, in the centre of Crimea, so I’m just hoping they let me back in. There is one major benefit for me and my school here (if the information I found can be believed) – a Russian work visa is only about £35, compared to the £900 my Ukrainian visa cost me. One of my students is choosing her university for next year. She really wants to study in Kiev as she loves the city, but her mum is now trying to persuade her to study in Russia. There are rumours that students from Crimea will not have to take entrance exams for Russian universities if they plan to start their courses in September. The recognition of Ukrainian degrees in Russia, and Russian degrees in other countries, particularly Europe and the US, is a major dilemma. I can’t imagine having to factor this kind of choice into my university decisions – it was hard enough choosing a course and a city as it was! Those training to teach Ukrainian language and literature will now probably have to move to mainland Ukraine to get a job. There is also the question of what will happen to the Ukrainian schools in Crimea. Will they be allowed to continue to operate, or will they be changed to Russian schools? What will happen to the curriculum in all schools? Will they have to change it completely? If they do, that means buying a lot of new resources, textbooks, etc., all of which will cost money, as well as causing the inevitable problems with teachers being less familiar with new subject matter. At present, most of Crimea’s gas, electricity and water comes through the northern tip of the peninsula, where Crimea meets Ukraine. If Ukraine chooses to close off these links, there will be major problems here. It will take a long time and a lot of money for Russia to create the infrastructure to send these things through Kerch, in the east of the peninsula, or to create the means for Crimea to generate the electricity and water it needs by itself. The transport system is in a similar state. There is a train line from Sevastopol to Kiev, and onwards to Moscow, running through the northern tip of the peninsula. What will happen if Ukraine decides to cut off this connection? There is a ferry from Kerch to Russia, and there are plans to build a bridge linking the two. Flights from Simferopol airport currently go to Istanbul, Kiev and Moscow. I don’t expect the Moscow flights will stop, but I think there’s a possibility that the ones to Kiev might be stopped by the Ukrainian government, and the ones to Istanbul might be stopped because the Turkish government supports the Tatars. Last year, Crimea welcomed nearly 6m visitors, and, according to one estimate, earned as much as $1.5bn from them. A collapse in revenue could endanger the livelihoods of thousands of people employed in the tourist trade. However, since the unrest started in Kiev, well before it arrived in Crimea, cancellations started being made. Now there have been almost 100% cancellations in Sevastopol, according to one of my students in the tourist industry. This summer will probably be very quiet, and there will be a knock-on effect for the Crimean economy, as without the money the tourists bring, there will be a huge hole in the finances here. As well as all of these major areas, there are lots of little things which are going to change in life here over the next few months, or maybe even longer. From the 30th March, we will be on Moscow time (GMT +4), rather than Kiev time (GMT +2). I think we should actually be on GMT +3, but I won’t complain about the few extra hours of daylight in the evening, and not being woken up so early by the sun in the morning! Website addresses will have to be changed to reflect the change of country. Many people here in Sevastopol already have .ru email addresses. In fact, I don’t think I’ve been given a single .ua one, about from the one of my school. The country code for phone numbers will also have to change. Cars will have to be reregistered to have Russian number plates, rather than Ukrainian ones. There is also the question of passports: will people have to change to Russian ones, or will they be able to continue using their Ukrainian ones until they expire? 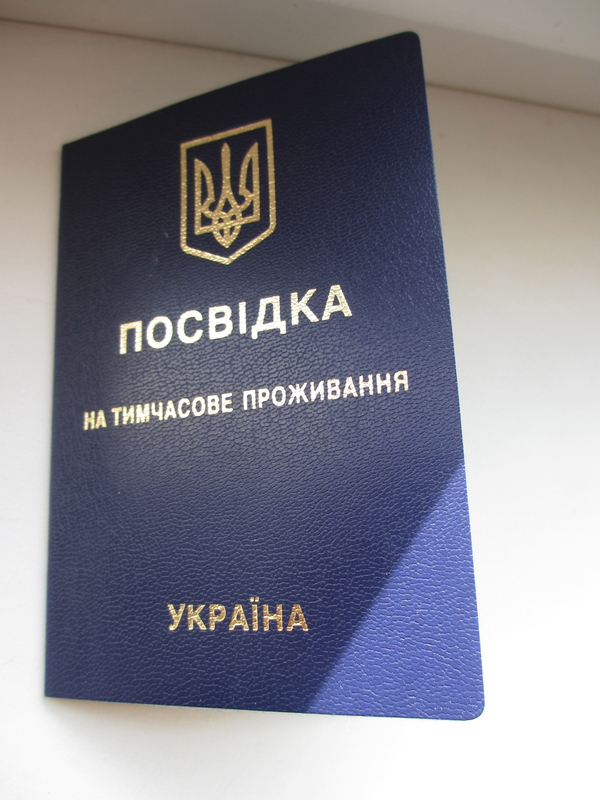 Will there now be a lot of Ukrainian ‘expats’ who choose to stay in Crimea on Ukrainian passports? I’m sure there are many more changes which will happen, and other ones occur to me all the time. They are certainly interesting times to be living in. Although I could have had no idea about all of this before I came to Sevastopol and was worried about it for a while, I now think it is fascinating to be here and experience this from the inside. I’m an English teacher, not an analyst or politician, and until a few weeks ago I had no real interest in politics, and no knowledge of Ukrainian or Russian politics at all. Everything I’ve written in these blog posts has been my own views, shaped by what I have seen and heard in the press and from the people around me. If I seem to be treating some things more lightly than they perhaps deserve, it is because I and the people I live among will have to deal with all of these changes. There are enough serious issues in this transition that I have to find the silver linings. Having said that, I do not regret my decision to stay in Sevastopol, and I hope to be here for a good while yet. If you want to read a more professional analysis, The Washington Post has a very good analysis of how things could change, including many of the areas I’ve touched on in the this post. Reading through my posts shows how my views have changed over time. It is impossible to know what will happen next, but these are undeniably important times for Crimea, for Ukraine, for Russia, and for the world. I only hope that none of the issues raised here will lead to war. I like a lot the way you describe from within the situation in Crimea. It helps me understand abit better the things that are going on, the tension it causes in the Western world. Good luck, especially coming back to… Ukraine?, Russia?